Port Elizabeth - Proteas seamer Rory Kleinveldt says the second Test against Australia late last year was a significant moment in his young international career, and he's looking to draw on that experience. The 29-year-old had a horror start to Test cricket when he returned figures of 0/86 against a rampant Australia who amassed 565 for five declared in Brisbane. However, he showed significant improvement in his second Test in Adelaide, when he picked up four wickets for 146 runs over teo innings. Misfortune for Vernon Philander means that Kleinvedlt will now earn his third Test cap in the second Test against New Zealand at St George’s Park, starting on Friday. The Port Elizabeth surface will test the bowlers, who have had discussions about the expected low and slow conditions and will be coming up with new plans to exploit them. Kleinveldt says the visitors will take some hope from their fight-back in the second innings so starting well will be important. Morne Morkel will share the new ball with Dale Steyn in the absence of Philander, with Kleinveldt assuming a back-up holding role. Proteas vice-captain, AB de Villiers, says although Philander and Kleinveldt are two different bowlers, the latter can achieve the same results with his style of bowling. 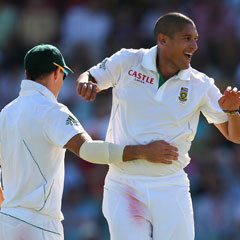 “We all know what he is capable of,” De Villiers said about the seamer. “We have seen him perform at domestic level and also in Adelaide where he bowled well. “I have faced him quite a lot in the nets before,” De Villiers added. “It’s different to what it is in the middle, but he is always consistent and asks a lot of questions. The Proteas have crashed to their first-ever ODI series defeat against New Zealand at home. The main reason was... ?